If you are one of those who are eagerly waiting for Google Glasses to release, here’s good news for you. It is releasing sometime this year itself! Google glass looks like one of your very normal everyday reading glasses, if you look at it from a distance. But once the you move a bit closer and have a look again, you realize, this isn’t just any pair of glasses that you see every day, it has a strange frame made up of aluminum and plastic. And when you look even more closely, you will also be able to see a small, but very prominent rectangular (almost) shaped frame residing on the top right corner. And thus, Google introduces us to Google Glass. The Google Glass project started about 3 years ago in the Google X Lab, by an engineer named Babak Parviz. 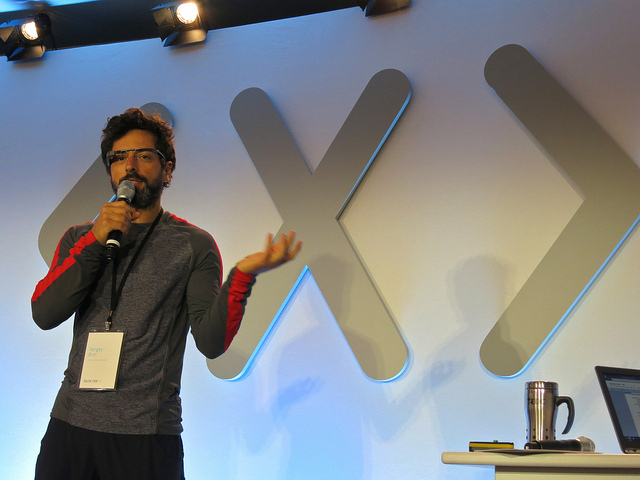 Google X Lab is known for its unusual and realistic R&D projects. I am not sure what’s happening with the other projects in there, but the Project Glass is almost out of the research projects and will likely be in consumer’s hands much before than we had anticipated. If the product director Steve Lee and lead industrial designer Isabelle Olsson are to be believed, then it will be available for us to buy this year itself. Why do we need Google Glasses? We have so much technology around us these days, sometimes makes me wonder if life would have been more peaceful without it. Compared to 4 years ago when my cell phone used to be in my pocket all the time, today I pick up my phone every few hours, sometimes every few minutes even. And that’s not because I am getting that many calls, it’s because my phone is always giving me some or the other notification. And that is what Google aims to change with Google Glasses. Confused? So was I, let me explain. I quite agree with that. When you are in a car, traveling, passing through mountains or some amazing scenery that you just HAVE to capture, and you do capture it with your phone/camera to watch it later, but that’s about it. You never actually got to enjoy or cherish that moments directly through your own eyes; you always had those lenses in between. Google glasses promises to change that. It doesn’t want you to miss that awesome sunset in the river or your kid’s first play the school, they want you to watch it for yourself and record it at the very same time for other to watch it later. Steve Lee explains it further saying, “We wondered, what if we brought technology closer to your senses? Would that allow you to more quickly get information and connect with other people but do so in a way — with a design — that gets out of your way when you’re not interacting with technology? That’s sort of what led us to Glass. I can’t stop looking at the lens above his right eye. “It’s a new wearable technology. It’s a very ambitious way to tackle this problem, but that’s really sort of the underpinning of why we worked on Glass”. Google got all the tongues wagging when they released the first Google Glasses Project Glass demo (Video)some 8 – 10 months back. It made us all wonder, can Google really do that? And then we thought, yea maybe they could, but it’s a still years away, for sure. But Sergey Brin started wandering the streets wearing those glasses, which of course, grabbed headlines as it should. Now people started to take things more seriously. They are really doing it, so it won’t take that long a time, for sure. And here we are, discussing the probability of us using it this by year. According to me, the amazing part about these glasses is the fact that it actually gives you the option to change the shape of the glasses which is removable. Also, the frame is available in different colors such as gray, orange, black, white, and light blue which they prefer to call: Shale, Tangerine, Charcoal, Cotton and Sky. On the right side of you frame, you will find a small button saying Glass, which also works like a touchpad. In order to activate your glasses, you need to touch that button and slowly tilt your head upwards, which activates your glasses and it is now ready to take commands from you. Yes, you can actually use those commands which they have shown in their videos. You will also see the Time displayed on the small box that will appear, along with a text beneath it which reads,”ok glass”. You can start issuing commands by starting them with “ok glass”, and to scroll for other options, you have to use the pad on the frame. Moving your finger backwards or forwards will allow you to scroll, tapping on it will select the current option, moving finger downwards on the pad will take you back. I think it would only take a matter of time before we get used to these options which appear to be very easy. The important, or rather, more often used features like maps, capturing pictures and videos, will be done with voice command only, without involving the Glass Button. You can search google by simply saying, “ok glass, google” followed by the keyword. You can tether the Google Glasses via Bluetooth or Wi-Fi to any Android device or an iPhone to use its internet data. The company has also informed that Google Glass will cost “less than $1,500” when it goes on sale. Google also made the Explorer edition, which is like a more advanced version, available to “creative individuals” for the same price. But you have to convince Google that it will help shape the future of Google Glass. The company, however, also knows that although it is a polished product, there is a lot of work to do to perfect it. It also plans to provide monthly updates, once the Explorer edition is available. The device looks beautiful, and exudes elegance. It is sure to make heads turn once you go out wearing it. A lot of people who don’t know about it will ask you, and a lot more you dont even know will want to ask about it. Once it releases and if you do buy it, it sure will top the list of your priced possessions. Your friends and everyone you know will also want to get their hands on it, which will worry you more, considering you have paid a cool $1,500 (Hopefully less) for it. You know you want to buy it someday, even though you don’t really require it. The only thing we can do for now is waiting for the company’s next announcement about its release date.